The Capital Area Physician Experience (CAPE) is a coalition, organized by the Capital Area Health Alliance, that focuses on recruiting and retaining physicians in the Mid-Michigan area. Changes in demographics and in models of health care delivery present challenges for communities across the country as they seek to attract and retain the physician workforce needed to meet their community needs. The Greater Lansing area is no exception. Through CAPE, leaders from medical education, hospitals, physician groups and the community are working together to develop strategies to show students, residents and practicing physicians that the Capital Area is a great place to live and practice medicine. The Alliance is unique among Michigan’s regional health coalitions in convening a group to address physician workforce needs. CAPE activities include educating the community about the importance of a vibrant physician workforce to our economy, engaging medical students and residents in community activities, recognizing leaders who support CAPE efforts and collaborating to develop a physician workforce that can meet community needs. Promote residencies in the Greater Lansing area. Graduate Medical Education (GME) location can be a strong influence on eventual physician practice location, and the committee plans to reach out to student groups at MSU to share information about all residencies in the Lansing area and to promote residency opportunities in psychiatry and primary care, two areas of high need in the Capital Area. Work with area GME programs to gather information on where physicians are going after completing their residency. Work with physician recruiters to develop an information and resource guide to the area, focusing on the issues of special interest to physicians considering practice in the Lansing area. Support residents, new physicians and their families, by developing resources and linkages to help physician spouses find employment, and holding focus groups of residents and newly recruited physicians to gather information on how we might promote the area and offer a welcoming atmosphere. 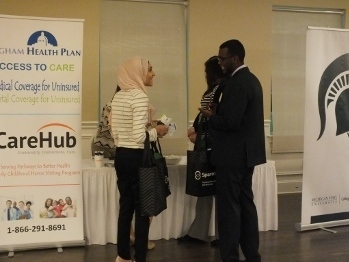 With the intention of supporting and recruiting physicians, residents and their families, CAHA worked with physician recruiters, medical school leaders, and the county medical society to create Benefits of Living and Practicing in Greater Lansing. 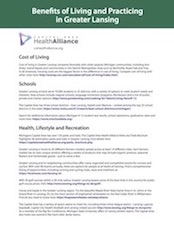 This resource is available online and in printable form for use by health systems and physician practices. Topics covered include area schools, commute times, housing prices, recreational opportunities, entertainment and research, teaching and clinical trial opportunities. The Dine Around is an annual event that provides medical students with the opportunity to discuss future career choices and specialties with area physicians and discover the many benefits of living and working in the Capital Area. 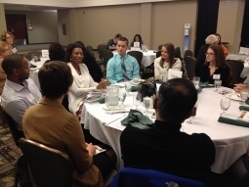 Students are able to network through the evening in a “speed dating” format and attend roundtable discussions based on specialty and practice. CAPE will host its Eighth Annual Medical Student Networking & Dine Around Evening this year. Contact the Alliance if you are interested in being a Mentor Physician or a Sponsor of the 2016 Dine Around. This presentation, which is open to the community, will consider community approaches to physician recruitment and retention. There will be a presentation by Allison B. McCarthy, MBA, Principal at the health care consulting firm Barlow McCarthy. The presentation will be followed by a panel discussion and Q & A session. The symposium will feature discussion of community needs, current shortages, and how we can collaborate to achieve collective impact on the physician workforce in the Capital Area. CAPE is hosted by the Capital Area Health Alliance, and meetings are held every other month at the Forest Community Health Center. Additional members are welcome. If you are interested in becoming involved with CAPE and attending a meeting, please contact the Alliance at connect@cahealthalliance.org. Hosted its Eighth Annual Medical Student Networking and Dine Around Evening at the Eagle Eye Golf Club on November 3, 2016. The Dine Around offers medical students the opportunity to discuss future career choices and specialties with area physicians and discover the many benefits of living and working in the Capital Area. Almost 65 medical students and their significant others were joined by 25 practicing physicians and resource people from 19 different medical specialties. 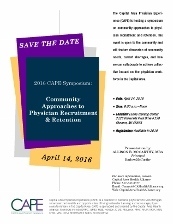 Hosted a Spring Symposium on Community Approaches to Physician Recruitment & Retention on April 14, 2016, with a focus on how the whole community can engage in the process of creating an environment that is attractive to physicians. Allison B. McCarthy, Principal at Barlow-McCarthy, spoke to successful community approaches to recruitment and retention and what today’s physicians are looking for in their work environment. There was also a presentation on the current Tri-County community needs assessment and a panel discussion to engage attendees in a dialogue about creating a community approach to physician recruitment and retention. Along with CAHA's Healthy Lifestyles Committees, co-presented Let's Walk & Talk with a Doctor (LWTD), a community-wide initiative that gives residents the opportunity to meet, walk, and talk with local physicians at beautiful local parks while learning about the great benefits of being physically active. The 2016 series ran April through September on different dates and at different locations throughout the Tri-County area. Sixteen area physicians have participated in LWTD events from 2014 to 2016. All of the events were FREE. Developed an affinity sponsorship program to support both specific events like the Dine Around and Spring Symposium as well as other impactful initiatives, including allowing for some capacity building.